Air, Water, Structural Testing « National Certified Testing Laboratories, Inc.
Building envelope products provide safety, security, as well as aesthetic appeal and improved efficiency to a residential and commercial structure. 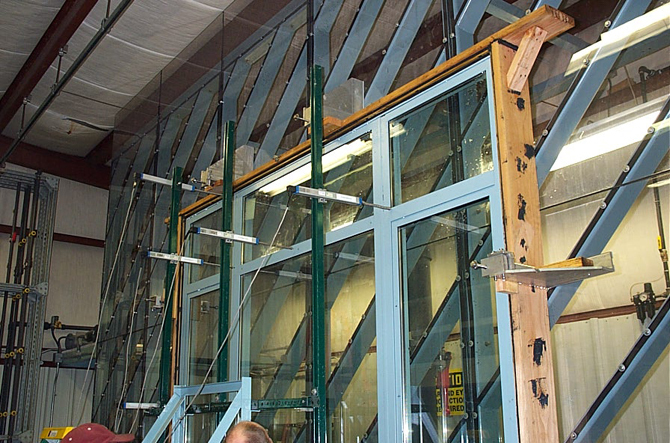 Air, Water and Structural Loads performance testing of fenestration products is an important factor in creating, marketing and the continued success of manufacturers’ products. Regulatory agencies, building officials, state building codes, design professionals, specification writers, building owners, architects and consumers can employ testing results to compare similar products without having detailed knowledge of how a window/ door/ skylight is designed and/or tested. Industry practice dictates the use of ASTM test methods which are consolidated into the current AAMA 101 (AAMA/WDMA/CSA 101/I.S.2/A440) document. This standard presents performance requirements based on the type of window and its size. Below are the specific AAMA size requirements which differ from NFRC test size requirements.